Along with the introduction of the next-generation MX-5’s Skyactiv-Chassis, the Mazda MX-5 Miata 25th Anniversary Edition revealed in New York is a special edition model that brings together 25 years’ worth of fun shared with fans. Based on the power retractable hard top model, and available with either 6-speed manual or automatic transmissions, it is available exclusively in Soul Red Metallic. Meticulous attention to detail has been paid in every area of the vehicle such as the black-painted roof, A-pillars, and door mirrors; off-white leather upholstery and door trim, hand-finished decorative panel, and the adoption of Bilstein dampers. No other mechanical changes have been made to the MX-5. 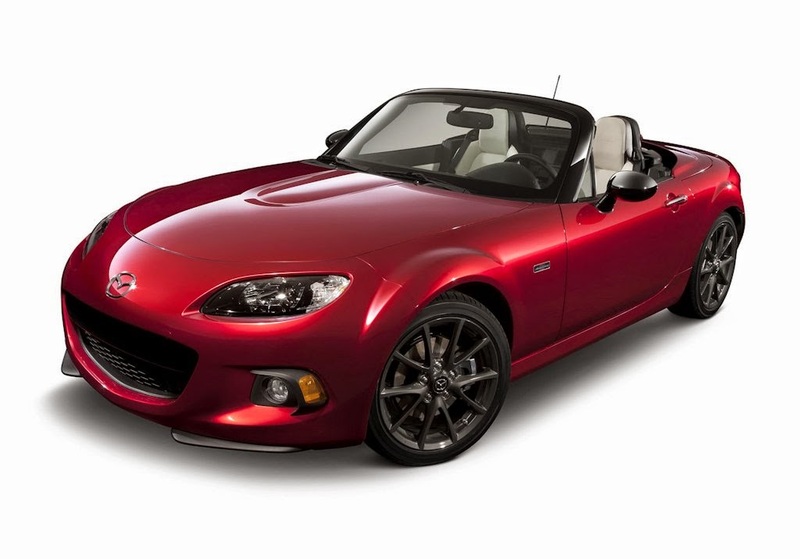 To celebrate the iconic Mazda MX-5’s 25th Anniversary, a special 25TH Year Anniversary Edition was recently announced at New York International Auto Show to be made available worldwide. Of the approximately 1,000 units to be produced, Mazda Philippines has been allocated a maximum of 25 units. The Limited Edition will be built and imported from Japan. Also affectionately known as the Mazda Miata, the MX-5 has spanned three model generations with over 940,000 units manufactured since 1989. It has held the Guinness World Record for “Best Selling two-seater sports car” for fourteen straight years. The fun lightweight sports car is the embodiment of Mazda’s carmaking philosophy as it realizes Mazda’s concept of Jinba Ittai, or horse and rider as one. 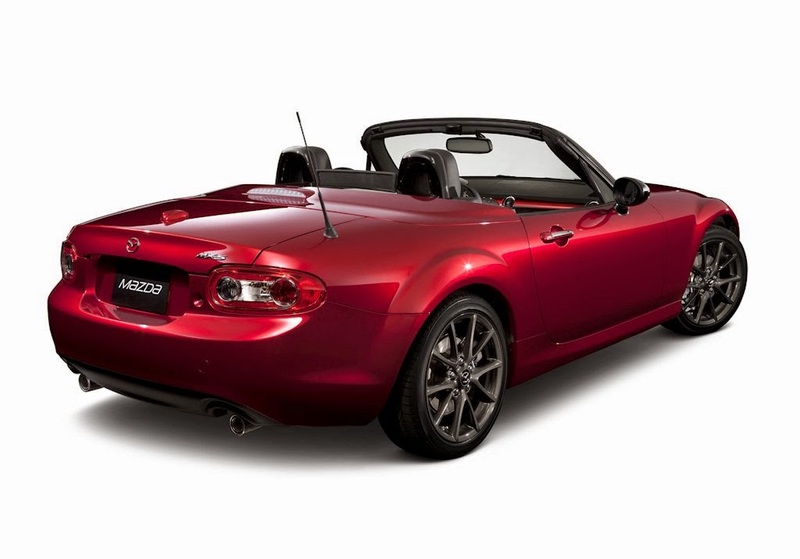 The MX-5 25th Anniversary Edition is based on the current third generation Miata Power-Retractable Hard Top (PRHT) model. It will come in the much sought after Soul Red metallic premium color with Brilliant Black A-pillars, windshield surround, side mirrors, rear seatback bars, headlamp bezels and retracting roof. A set of 17-inch 10-spoke aluminum wheels in gunmetal finish round up the outside accents. A single 25th Anniversary badge with the vehicle’s identifying serial number is mounted on the driver’s side fender to emphasis the unit’s heritage. Inside, almond leather seats and stainless steel scuff plates come embossed with the 25th Anniversary logo. Red-contrast stitching on the seats, the floor console lid, manual shift lever boot, parking brake lever and door armrests highlight the uniqueness of this model. Piano black steering wheel spokes, satin-chrome meter rings, and a hand-painted dashboard decoration panel embolden the interiors even more. Drilled aluminum pedals lend themselves to precise heel-and-toe operation making this limited edition Miata just as fun to drive as the original model. Underneath the hood, the MX-5 25th Anniversary Edition sports pistons, connecting rods and a flywheel selectively matched to provide the best engine balance and to reduce weight. This makes the already peppy 2.0-liter MZR engine rev livelier. Combined with special Bilstein shock absorbers for manual transmission models, the limited run MX-5 embodies the brand’s appreciation for enthusiasts who value driving pleasure. The MX-5 started off as lightweight and compact open-top two-seater with a front mid-ship engine on a rear-wheel-drive platform with production kicking off in April 1989. Mazda intended the MX-5 to be a driver’s dream car with its 50:50 front-rear ratio weight distribution an low yaw inertia moment. With its distinctive retractable headlights it has endeared itself as the affordable sports car for everyone. Only 200 units were officially sold by Mazda dealerships in the Philippines in the 1990s. Since then, it has spawned a generation of roadster fanatics, spearheaded by the Miata Club of the Philippines (MCP), who have remained loyal fans to the MX-5’s pureness as a fun driving machine. “Some of our Club members are even travelling to Mazda Raceway Laguna Seca in the California, USA in September to join the thousands of Miata fans the Global Mx-5 25th Anniversary Celebration. The event is set to be the party to end all parties. ”Alvaro added. The 25th Anniversary Edition will be priced at a very special PHP1,800,000, with planned delivery in August this year. As recognition and tribute to the Miata Club of the Philippines its members are given reservation priority on the 25 units. Interested members of the public may contact MCP Secretariat to enquire on reservation and membership. More activities will be announced soon to celebrate the Miata nameplate’s quarter century milestone and the 25-year pursuit of the unique style of driving exhilaration that only Mazda delivers. Berjaya Auto Philippines is the exclusive distributor of Mazda vehicles and parts in the Philippines. Current product line-up includes Mazda2 sub-compact sedan and hatchback, the recently launched all-new Mazda3 SKYACTIV compact sedan and hatchback, Mazda6 executive sedan, CX-5 compact SUV, CX-9 seven-seater SUV, MX-5 2-seater sports roadster and the BT-50 pickup truck. There are 14 Mazda sales and service dealerships located across Metro Manila – Mazda Greenhills along EDSA, Mazda Pasig along C5, Mazda Quezon Ave., and Mazda Alabang – provincial dealerships are located in Pampanga, Dagupan, Cabanatuan, Batangas, Cebu, CDO, Tarlac, Cavite, Iloilo and soon to open Mazda Davao. Your price guide has the Miata priced at 2.2million and now comes the limited edition selling for 1.8million, what gives? does that mean the regular Miata could be had for around 1.5million now?